A Blog on Good Food in Washington DC, Any Place, Any Price. I’m rather fond of Ethiopian food, and I have had my fair share of this East African cuisine since my arrival in this city 25 years ago for Grad School. 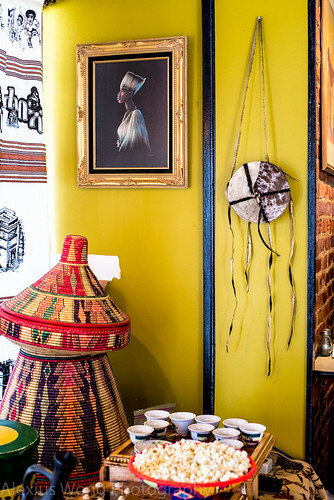 Over the years, the DC area has become a destination point for Ethiopian immigrants, and the result is no shortage of restaurants that offer their cuisine. However, I have always had a difficulty deciding which restaurant to visit to do a write-up on since nearly all offer the same dishes on the menu. 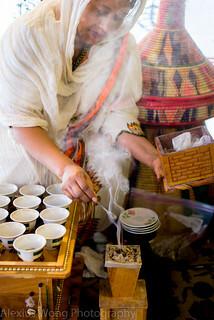 But when I saw an online coupon for a fairly new establishment in the Brookland neighborhood, a most unexpected place, that performs an Ethiopian Coffee Ceremony, I knew that this was the exact place for me to review. With coupon in hand, I paid them a visit recently for this review. 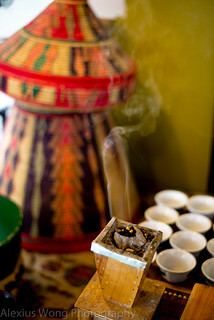 Walking into Askale Cafe, one is immediately enveloped by a cloud of burning incense, smelling rather strong of myrrh and reminding me of being in a Cathedral and evoking the feeling of an Ethiopian Orthodox church. 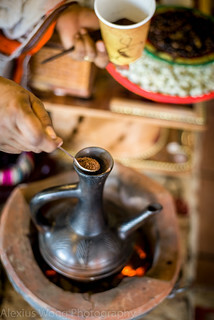 Throughout the ceremony, the Mistress of Ceremony was refilling the burner with some incense powder. A earthen pot carrying burning charcoal was later brought in, a sight that I have not seen since my grandmothers were alive more than 30 years ago. 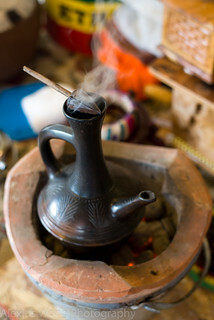 Burning embers were removed and placed in the incense urn to keep the incense powder burning throughout the ceremony. 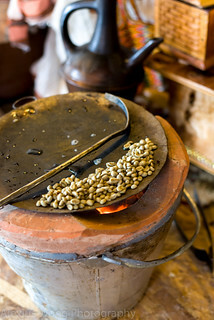 A brass plate was placed on top of the fire, topped with raw coffee beans with a sickle-like brass rake next to it. 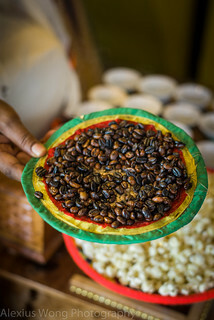 Notice the light color of the coffee beans. The beans were raked over the hot brass plate until it is quite dark in color, but not burnt like in American or French roast. The roasting took quite a bit of time, with the MOC keeping a vigilant eye on the beans and without stopping the raking motion as it got faster as the beans became darker. Once the desired roast was achieved, the beans were removed to cool down on a jute-leaf plate. Notice the popcorn in the background which was used as a palate-cleanser later during the coffee drinking. 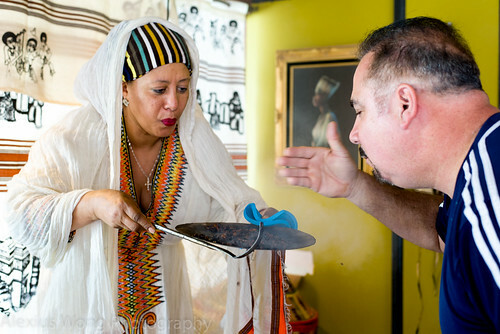 As part of the ceremony, all guests were invited to catch a waft of the roasted beans. The smell was beyond the immediate roasting smoke, exuding aromas of enticing roasted coffee beans with their toasted notes and creating an anticipation of its potential liquid form. 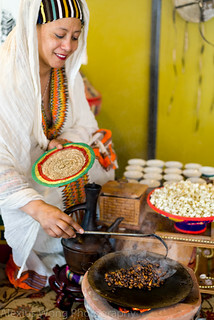 Once cooled, the whole beans were ground finely and poured into a jet-black earthen jar that had been set on the burning coals that had brought some water to a boil. A wooden stop was used to keep the steam in while the ground coffee was brewing. When the coffee was sufficiently brewed, it was poured into small cups, much like Chinese teacups, in a single stream without any breaks, a symbolism of the continuity of life despite its ups and downs. 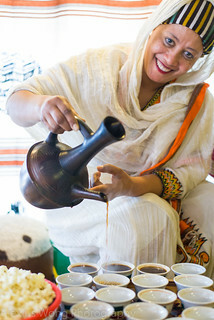 One sip of the brew was quite a revelation: The hot drink had a full-bodied flavor devoid of the bitterness found in stronger roasts. A certain fruitiness was evident in the rather high acid level on the tongue, pointing to the nature of the bean and the fruit around it, this further emphasized due to the lack of sugar as recommended by the MOC. After adding a bit of sugar, the sourness was more palatable. Not exactly what I expected but I knew it was going to be a different cup, and I was enjoying the whole experience of watching from bean to brew. On to the food. 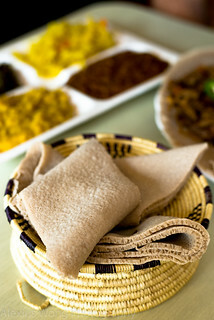 We ordered the vegetarian platter listed as Ethio-Mix. 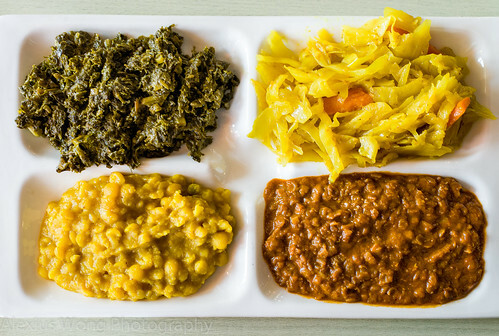 From top left clockwise: Gomen – collard greens cooked with some garlic and spices that enhanced the dark-nature of this green, lightened by a touch of vinegar; Cabbage and Carrots – this mixture was cooked with turmeric without turning to mush, and the natural sweet notes were shining through with the cabbage and more so with the so-sweet carrot; Red Lentils – this legume was quite a hit with the lentils cooked until soft and tasting full-flavored and slightly sweet; Yellow Lentils – this legume was not as tasty as the previous side but I appreciated the mild flavors and its mealy texture. Overall, this was a successful vegetarian/vegan combination that was wiped clean off the platter that they were served in. For the meat, we ordered Awaze Tibs. Strips of beef were cooked with garlic, onions, tomato, and fresh ginger along with some spices that made the meat bits very flavorful and a bit smokey from the condiments. The ginger added a fresh flavor, the fresh tomato a bit of sweetness and acidity to lighten the beef, and the slices of jalapeño the vegetal spice kick. The meat was a tad firm but I didn’t expect it to be smooth as butter either, and the whole mix was a hit for me and my companion. 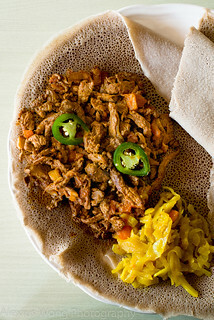 The fermented sourdough spongy Injera bread tasted light, fresh, and the right amount of sourness to be the perfect vehicle for all the vegetables, legumes, and meaty pieces. The customary use of hands in eating the dishes added to the satisfactory meal experience. Well this was the experience that I was looking for in order to write this blog. 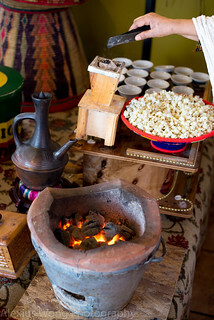 The coffee ceremony was not only charming but it was a cultural experience that was both revelatory and unique. 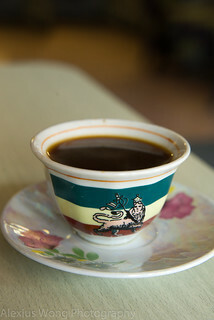 The cup of java was not exactly what one would expect due to his or her conditioning, but the flavor was aromatic and amazingly, there was no hint of bitterness on my tongue on the drive home. Still lingering on my taste buds were also the vegetable and beef dishes that my companion and I enjoyed for lunch, with the wonderful flavors and well-prepared dishes having a lasting impression on my mind. Yes, the service is a tad slow since it is a family run place, but the culinary experience was well-compensated by the quality of cooking and the personable treatment by the husband-and-wife team. 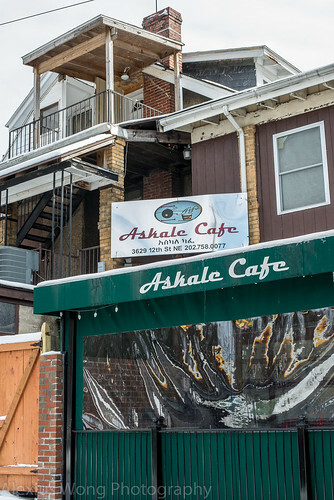 I can’t wait for their liquor license to be approved soon and for this cafe to turn into a proper restaurant. Once the ball gets rolling in that area, I’m sure it will be a hit in the neighborhood.